In far away America, two Nigerian authors, Chimamanda Adichie's, Americanah, and Chinua Achebe's Things Fall Apart, were named as some of the books that made former U.S. President, Barack Obama's favourite books of 2018 list. This was disclosed by Mr Obama on his Instagram last year and tagged the annual list a "favourite tradition." 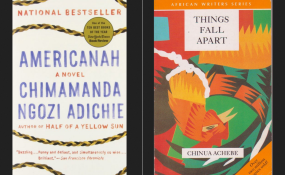 Americanah, which is reportedly being made into a film, is Adichie's critically acclaimed third novel while Things Fall Apart, first published 60 years ago, is hailed as the most widely read book in modern African literature. Unsurprisingly, Becoming, Mrs Obama's autobiographical memoir, topped the list, with a side note (obviously my favorite!). Obama's annual list highlights a wide range of critically acclaimed films, best-selling novels, songs and albums. "It gives me a moment to pause and reflect on the year through the books, movies, and music that I found most thought-provoking, inspiring, or just plain loved," he noted during the announcement. "It also gives me a chance to highlight talented authors, artists, and storytellers - some who are household names and others who you may not have heard of before."